Calendar 2019: Around Asia & Middle East in 13 photos – Anne. Westwards. It is hard to believe that I am back in Berlin these days, starting my self-employment as an author, speaker and photographer, narrating the stories of this cycling expedition. The goal of cycling the next continent is on the horizon, so I am maximally motivated to get things going. Just as last year, I selected 13 of my favorite photos from my journey, one per country I cycled through. 13 moments that meant a lot to me, both while I was taking the photo and now, in hindsight. Ready to follow along for a little mental journey? I have also created a beautiful calendar with these photos (without the watermarks), printed on paper to inspire every day with wanderlust and a sense of adventure. Have a look! 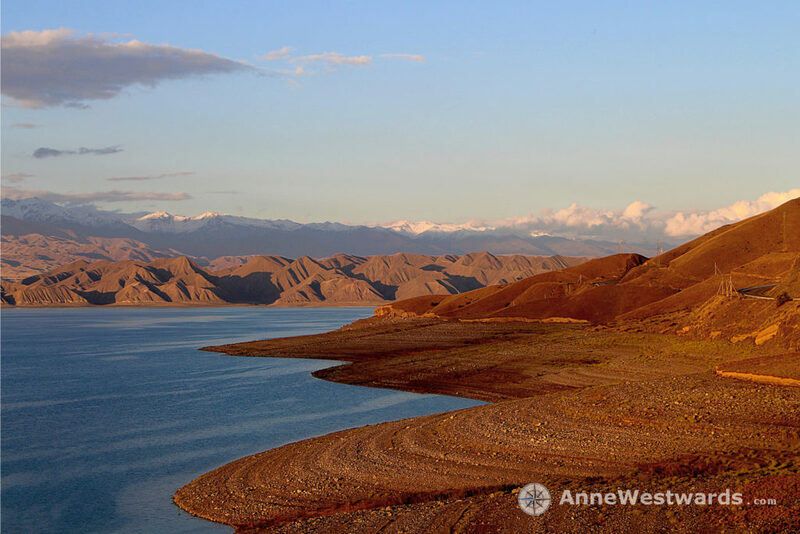 The landscape around Toktogul reservoir is lit up magically by the evening light. I hesitate for a moment – cycling in this wonderful time of the day has already become my favorite, even after just a few weeks on the road. But the prospect of spending an evening with other cyclists just sounds too good to let it slip. The first time for me to actually have that chance (there would be very few others in the year that followed, but I didn’t know that yet). What a fantastic decision it was! As it turns out, the little group consists of two more cyclists who already started to unload their bicycles at the back of the building. The four of them have already cycled through much of the Pamirs together, but they welcome me so warmly into their circle as if we had been companions for weeks already. The entire terrace is ours for camping, with a fantastic view over the gigantic reservoir. Dinner turns out to be a really tasty fish, caught fresh from the lake, and made even more wonderful by long conversations with my like-minded new friends. The cherry on the cake, though, comes early in the next morning: running downhills towards the shore and jumping into the water! The dust of days and days on the road slowly comes off my skin, while I take in the fantastic panorama of the barren hills around me. The very definition of happiness. How much more could you possibly need? 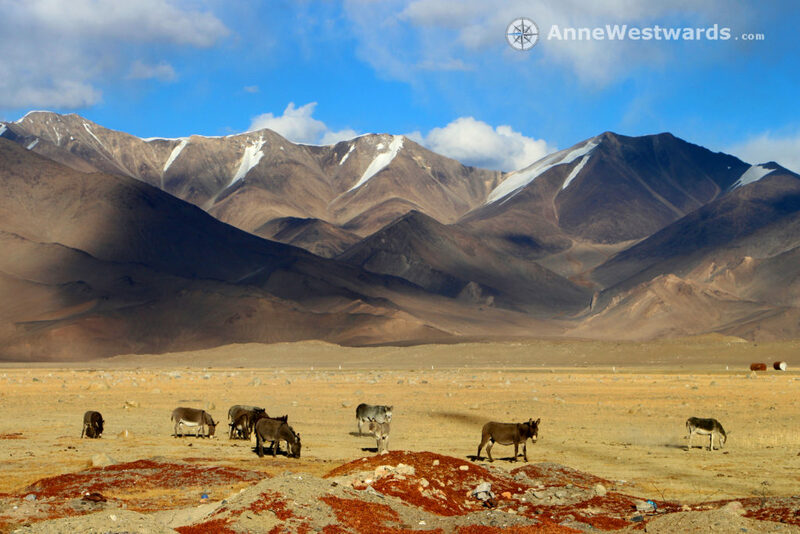 The stark beauty of the Pamirs can hardly be compared. The solitude up there is so deep, so quiet, that I sometimes feel relieved to hear my own breath, because it shows me that there is at least one living, breathing being out there: me. A great calm overcomes me, a calm that lasts for all those days that I spend up there. Just me, my bike, the road, the mountains. The villages are few and far between, the vehicles that will pass you are sparse. I lose myself completely in the beauty of the landscape, without ever feeling alone or lonely. And yet, when I meet this herd of donkeys, I feel a surge of joy welling up. I have decided to take a rest day in Karakol, a tiny village close to a beautiful lake. Strolling through the landscape by foot, I discover the donkeys of the villagers. Donkeys are a wonderful species – they show their feelings just as they are, without any attempt to ‘play it cool’, as some other animals do. If they are curious and feel like looking at a strange thing (for a long time), they’ll do just that. If they feel like frolicking and running around, that’s what they will do. The youngsters in the herd definitely were up for some playing, chasing each other around, jumping in the air with all fours, simply doing lots of nonsense because it was so much FUN. 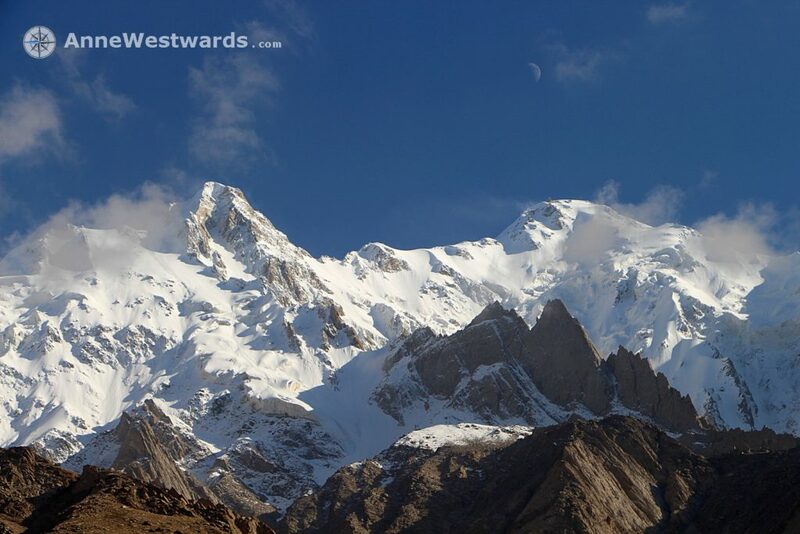 The Pamir mountains just put on their most tolerant face and continued looking as beautiful and sublime as ever. Oh, donkeys! Taking a lofty point of view changes your perception. 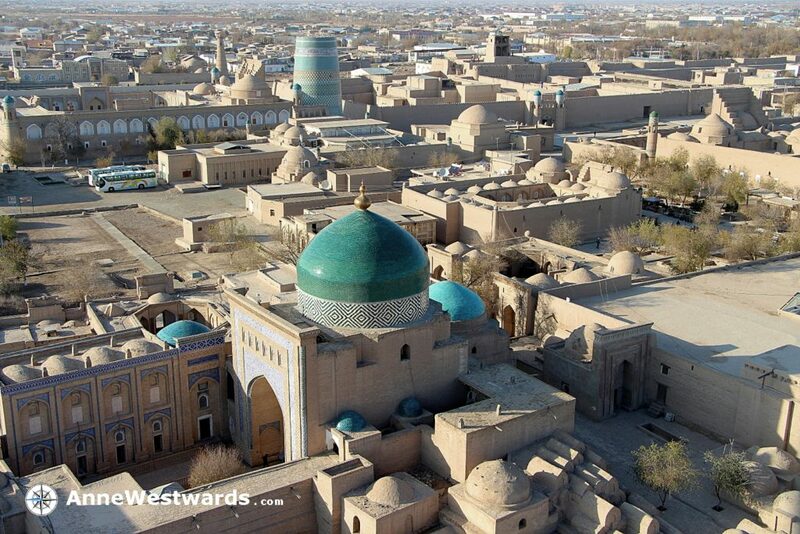 So I climbed Islom Hoja Minaret, at 57m Uzbekistan’s tallest, to take a look at the ancient city of Khiva. Once an important trading point on the Silk Roads, Khiva provided caravans with a chance to rest before venturing into the desert again. The wealth of the city and its traders resulted in an exceptionally beautiful city, protected by massive city walls. Nowadays, the Itchan Kala (old city) is listed as a World heritage site. And there is a lot to marvel at. An oasis inmidst of the vast desert. The sand-colored city, adorned by myriads of beautiful tiles in all shades of turquoise, yellow, white and blue. Even the giant stump of the unfinished Kalta Minor minaret seems tiny from above (the blue-tiled structure in the upper third of the photo). And maybe that is the point. This minaret was a megalomaniac project, started in 1851 by Mohammed Amin Khan with the aim to build a structure high enough to view the distant rival city of Bukhara. The project was abandoned when he died a few years later. And nowadays? Well, judging from the view I had from Islom Hoja Minaret, there is no doubt which one of the two is the tallest minarets of the country now. Soviet architecture is ubiquitous in much of Central Asia. In Aktau, you can’t escape it, no matter where you go. Aktau, one of the crossroads of my journey. Should I continue cycling? And where? Through Southern Caucasus? Through Iran? While pondering these questions, I lived a bit of a ‘normal life’. I rented a room and went about my business: going to the post office, getting photocopies of my passport, applying for different visas, changing money, organizing packing material for my bike Emily (in case I decided to fly to Iran). And for many of these seemingly simple, straight-forward tasks, endless amounts of questions needed to be solved. Make no mistake, this is former Soviet Union territory. There is no such thing as simply ‘making a photocopy’. One woman had heard rumors that in a certain residential building (‘the one with the portrait of our former president on it’) there ought to be a little computer club, where youngsters play games. ‘They might have a printer or such a thing.’ They did not. But they had another clue, another description of where I might get lucky. Only that again, they had no street name, no house number. It took me the better part of the day to hunt that other place down. Only that I was a few months late: they had stopped doing business, the neighbors told me. The scavenger hunt continued. In the end, I did manage to get my photocopies. I have never worked nearly as hard as getting a copy of my passport. But neither had I ever talked to nearly as many people in the process (in my almost non-existent Russian). Nor had I made nearly as many connections. People started greeting me in the street (‘Have you managed to talk to Olga concerning the photo copies?’). 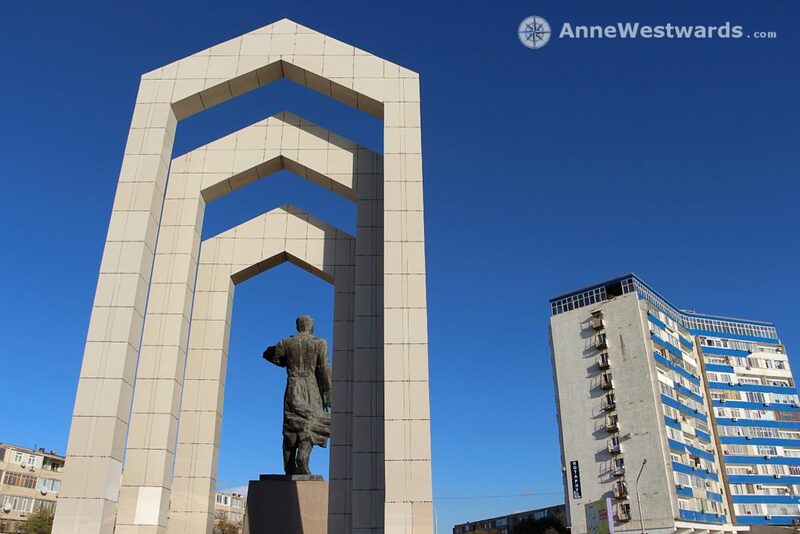 Yes, if you look at the architecture, the Soviet Union seems well and alive in Aktau. But it’s not only present in the buildings. It’s also the ability of people to help each other out, to manage – and to manage well – while things are not as easily available as elsewhere. And that creates a social fabric of a special quality. PS: If you need to make photocopies in Aktau, I can provide you with GPS coordinates of a hidden little place. But I would recommend you not to use them. You’ll learn so much more trying to find an option yourself. By the time I arrive in Esfahan, the snowstorm has given way to a light flurry of snow. As glad as I am about that, I am still miserably cold and wet, my clothes drenched and my spirit low. Thus, it is a huge relief to know that I have a good friend in town where I know I can stay. ‘You arrive on such a special day!’, Ali exclaims. ‘It hasn’t snowed in Esfahan in ages. This is a desert, after all.’ Ironically, one of the reasons for me to come to Iran was to escape the snow: I had changed my route completely, deciding against cycling through winterly Caucasus towards Berlin. Instead, I was following a strict route Southwards now, crossing Iran towards the Persian Gulf. Snowstorms were not exactly part of the plan. But Ali is right: Esfahan is located in a desert, so between hours of snow, ample sunshine lets the ice crystals sparkle and shine. Excitement about the white present captures old and young, men and women alike. The rapture streams through the narrow lanes, the bigger avenues, channeled into the bigger spaces of parks and squares. Whenever it begins snowing, faces of people light up, eyes are raised towards the myriads of tiny snowflakes that sail downwards from dark clouds. 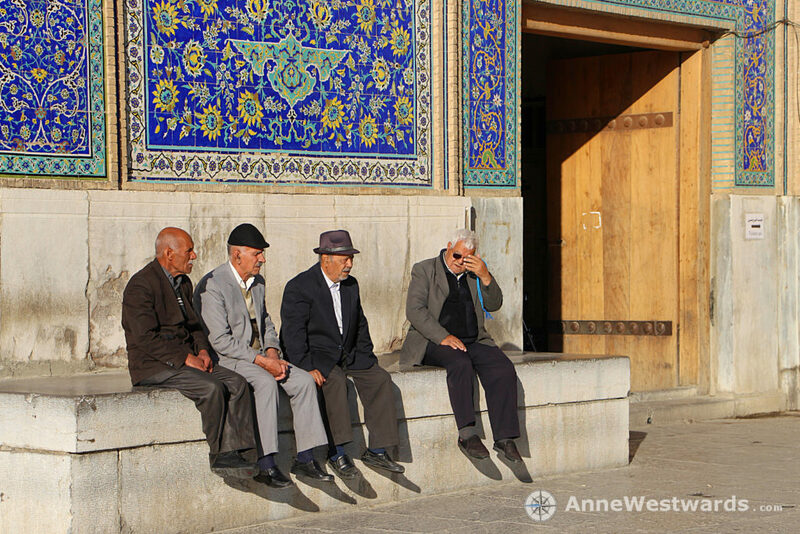 And whenever the sun comes out, the people of Esfahan use this chance to catch a bit of warmth in midst of winter. Groups of friends assemble outdoors, happily ignoring freezing temperatures and wet benches, aware of the specialty of this particular moment, this particular day. And I? I decide to stay for a while and let myself be absorbed in the wave of general enthusiasm about snow, sunshine and life. Coming from Iran, the United Arab Emirates seem like an optical illusion at first. The giant malls, the all-engulfing consumerism, the shiny cars, the never-ending arrays of goods on display, the huge amounts of expats, you name it. Everything seems so huge and fast and … a little less human. Nobody invites me in for a cup of tea, nobody asks if I was okay, nobody welcomes me to their country, as Iranians had done all the time. I am as anonymous as anyone living in those giant skyscrapers would be. Skyscrapers and highways (‘6 lanes, 12 lanes, we can build the widest highways in the world!’). Maybe these could have given me a feeling of coming back ‘home’ into the consumer world as I knew it, but they only left me estranged. I felt stranded, as if the Persian Gulf had washed me ashore. At the same time, I can finally feel the wind in my neck and on my bare feet and wrists again – no Hijab required anywhere, no headscarf, no need to dress in baggy clothing. At the same time, my worn out, faded clothes seem mildly inappropriate in this shiny bubble that I have just entered. My bicycle and me, dusty and rugged as we are, obviously do not fit in. And then, I can hear the muezzin, calling the believers to prayer. At that moment, everything seems to come together. After many months in Muslim countries, I have become so used to the calls to prayer, that I started using the calls to structure my day. I rarely look at the time anymore. The rough idea of ‘between the third and fourth prayer’ is enough for me. Hearing the call to prayer in what seems like a very alien country, all of a sudden, gives me the feeling of having something to hold on to. Something to rely on. I would cope. 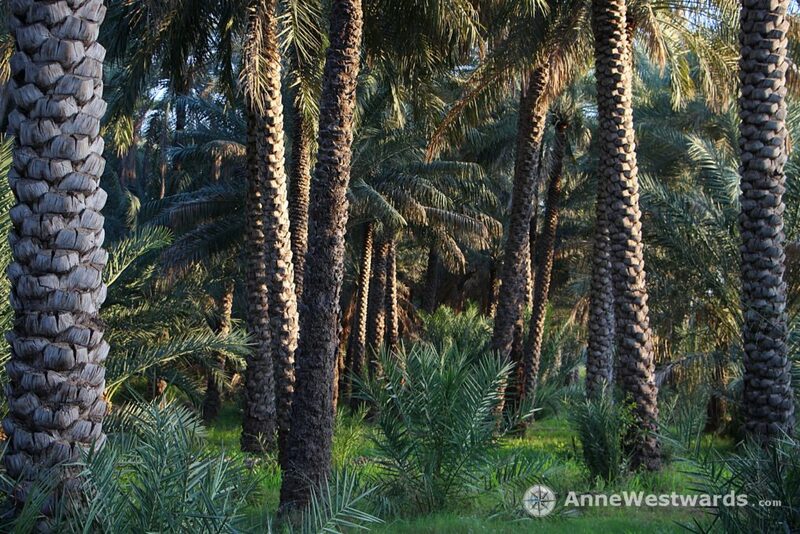 The moment you leave the scorching sun to enter an oasis is unforgettable. The semi-shadow engulfs you mercifully, providing immediate respite from the brutal desert sun. A sun that seems to burn through your skin right into your bones. A heat that is so intense that you feel as if your body would melt, turn into a puddle right away. And now: shadow, relief, delight. The heat immediately gives way to cooling breeze, a state of pure bliss. 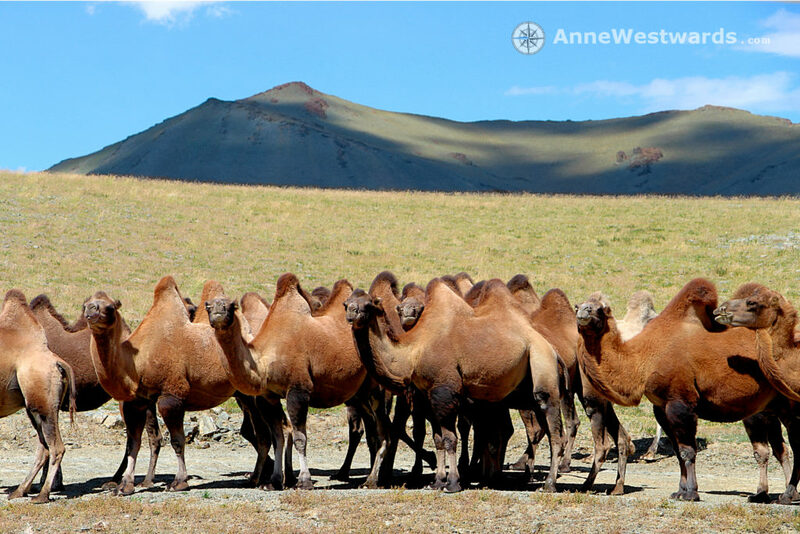 Meeting a heard of Bactrian camels always makes my day in Mongolia. And during those two months that I spend crossing this country from East to West, I definitely need something to lift up my mind! Thunderstorms, sexism, thirst, armies of mosquitos, deep sand – all of this is immediately forgotten as soon as I meet a herd of camels. Most often, I found them roaming the endless steppe freely, without any nomad in sight, lifting their giant feet ever so leisurely to make slow progress across the steppe. Despite their majestic height, Bactrian camels always seemed innately friendly. Despite all that is changing in Mongolia, this is still a country of nomads. While the country definitely does not suffer from overpopulation, the numerous herds of the nomads definitely have led to severe overgrazing. No matter where you go (or cycle), herds of goats, sheep and horses abound. The gentle Bactrian camels are a rare sight for me, however. And these huge animals surely are not accustomed to the sight of a solo cyclist either! As soon as the animals become aware of me, the entire herd stops, just as chatty neighbors would, in order to take a good, close look at this weird creature with its funny, loaded bicycle. Their heads follow me if I cycled forward. They trace me, when I cycle backwards. And forwards. And backwards. As if they were following a bizarre, little game of tennis, where I play both sides. After such an encounter, I spent the rest of the day smiling. Maybe it was the same for the camels. The fabled Karakorum Highway! I had anticipated this stretch for months. The idea blossomed in my my mind months earlier, while I was still cycling in completely other regions. The KKH was the reason why, once I had reached the Arabic Peninsula, I didn’t simply continue cycling on another continent. 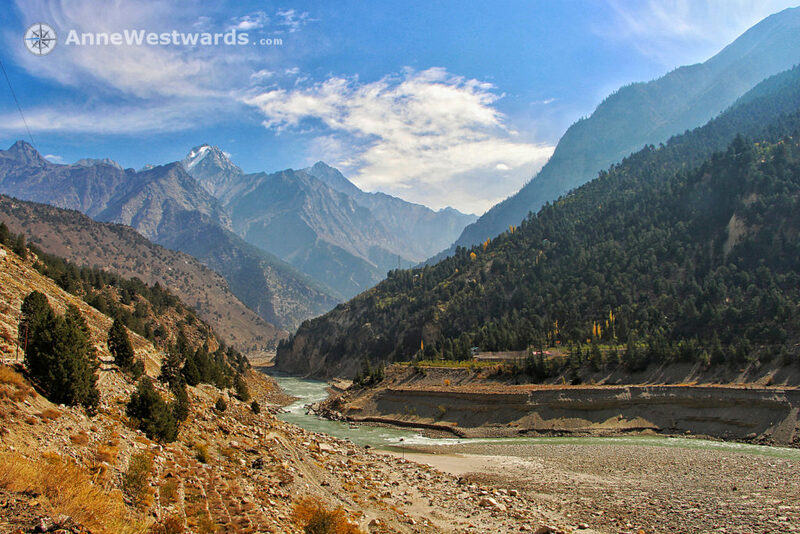 I had heard stories and seen photos of the Karakorum Highway (KKH) – and decided that I had to return to Asia. Mongolia, yes. Himalayas, hell yes! But my main reason for returning to Asia had been to cycle the KKH from China to Pakistan. The KKH links the North West of China (Xinjiang) with the North of Pakistan (Gilgit-Baltistan, Punjab and Khyber Pakhtunkhwa), leading over Khunjerab pass, at 4,693m (15,397 feet) the highest paved international border crossing in the world. So here I was, after so many months of expectation! But I was not on my bicycle. Giardia had struck me in Kashgar, China, the night before I had intended to start cycling the KKH. I had spent almost two weeks in a stupor of diarrhea, fever and pain, so weak that I was almost crawling on my fours when I needed to get to the restroom. Fortunately, I had made some friends who looked after me (other long-distance cyclists and backpackers). But the first day when the fog lifted from my mind ever so slightly, a realization struck me: the Chinese-Pakistani border would close for two weeks, due to the unfortunate coincidence of two major holidays (one on the Chinese side, one on the Pakistani side – and yes, they really do close the border during holidays). In my given state of health, I had no chance to reach the border in time. And by the time the border would open again, my Chinese visa would have expired and my Pakistani visa would be left with next to no time. So I needed to reach the border. Quickly. My current state of health didn’t allow me to get there fast enough by bike – I had two days left for what would have been four to five days of cycling, in healthy condition. So I packed my bike Emily, dragged myself to the street and organized myself a lift to the border. When I saw the mountains appear, from the window of the car I was in, the nausea and stomach cramps subsided for a moment. The Karakorum. Finally! Pakistan was ahead of me, the land of unknown hospitality and wonderful nature! ‘How about you come in for a tea first?’ The former army general waives me into his living quarters. The steaming hot cup of delicious chai in my hands, I listen to his stories, take a stroll with him through his little orchard. And then decide to stay for a bit and rent a room from him. A sparklingly clean room that faces one of the most beautiful mountains I have ever seen: the craggy peaks of Tupopdan (6,106m / 20,033 ft). I spend half a day sitting under apple trees, occasionally picking one of the delicious fruits. But predominantly, I spend those hours just looking at Tupopdan. This enigma of a mountain exudes an air of serenity that I find unparalleled. 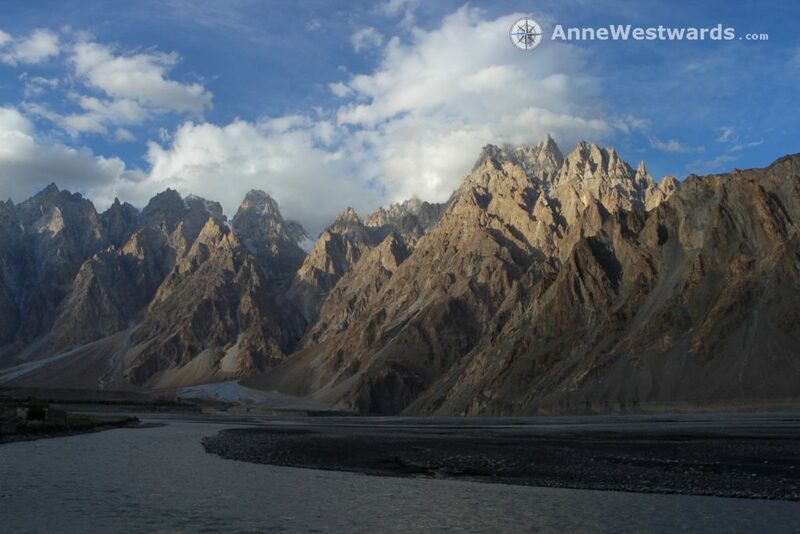 It is easy to understand why it is also called ‘Passu Cathedrals’. Passu is the name of the tiny village in which I am staying. Why cathedrals? Yes, the multitude of spires might physically resemble the turrets of an otherworldly gothic church. But I really felt the mountain ought to be revered as a wonder of nature, a powerful, sacred place that radiates deep calm and peace. In fact, I myself was a pilgrim to this cathedral. Ever since I first lay my eyes on a photo of this mountain, I knew I had to come here. Propelled by the fantastic stories my cyclist friend Tara had told me about her time in Pakistan’s Karakorum, I had already half decided that I should cycle in this part of Asia. But the decision became crystal clear once I actually saw that photo of the Passu Cathedrals. The mountain was calling me. And it was a call I could not possibly ignore. I spent much of my little time out in Passu just looking at this mountain. I knew I had come to the right place. Pakistan and its wonderful people turned out to provide so many more presents to me. But even if there had been nothing else to admire in this beautiful country, even if I had just cycled all the way to see this one mountain, it would have been worth it. If there is a call as powerful as this one, who am I to not follow? There is nothing quite like autumn in the Himalayas. Or really, anywhere in high altitude mountains. The air is crystal clear, the days still warm, but the nights are spent with clenched teeth and all the clothes that you can find in your panniers. The contrast of temperature between day and night will make you appreciate the warming rays of sun even more. And you appreciate every meter of altitude that you descend, as you get back into warmer climates … and back to trees. Who would have thought how wonderful trees can be? The soft sound of leaves rustling in the wind. The color and life they add to the landscape, even more so in autumn. After having spent weeks in high altitude deserts, where you don’t find bigger plants to speak of, trees become an outrageous sight, one that you cannot take your eyes off. The dots of yellow and orange inmidst the sea of green seem spectacular enough to warrant being listed as one of the wonders of the world. In Kinnaur valley, autumn also has a sound to it: the sound of knives hitting wooden cutting blocks. The apples are harvested and nearly every roof of a village will be occupied by an elderly women, cutting kilos over kilos of apples. The slices will dry in the sun of late autumn and turn into a sweet delicacy not long after. Dried apples, spectacularly colorful trees, clear air – autumn, the Himalayan way. 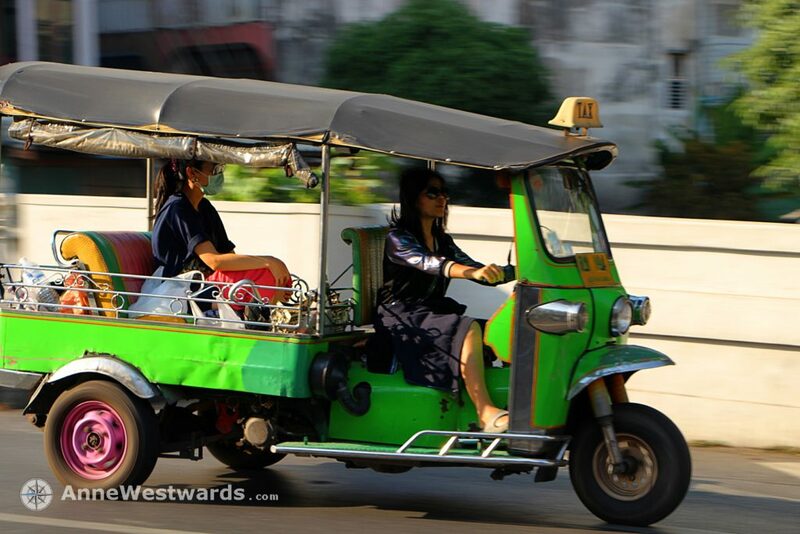 Thailand was a culture shock in more ways than I had imagined. The reason why I love cycle-touring is much is that it allows me to experience changes of culture, habits and landscape slowly. Very slowly. You are not dropped into a foreign environment like an alien from a spaceship (or airplane), you gradually move towards it, in tiny steps. The changes will be subtle for a long time, in particular in border regions where traders will move forth and back between countries. After a while, you realize that people’s clothing does looks a little different and dishes have an ingredient in them which you have not tasted in a while. Some of these changes feel abrupt, but really, the pace is nothing like taking an airplane. And then I had to take one. An airplane, that is. India’s currency was devaluated overnight, leaving me with a little more than 0,40 € of valid money in my pockets and very limited chances to get any cash worth more than the paper it was printed on. After a two week struggle, I finally managed to fly out to Thailand. Yes, my plans had been very different. But in the given circumstances, continuing to cycle through India just did not seem feasible. So the exact thing happened that I am usually trying to avoid: I was dropped into a culture that I had had no time to warm up to. Coming from the sparsely populated states of Ladakh and Himachal Pradesh, from the barren beauty of the Himalayas, the sheer density in Thailand blew me away. The lush vegetation, humid air, busy street life, beautiful orchids, countless supermarkets, functioning ATMs, Western expats, coffee house scene, evening rush hour, lively night markets, fragrance of lemongrass, artfully arranged still lives, quiet temples, vibrant student culture, everything, everything. A lot to digest, to marvel at, to revel in. So I took a quiet moment, amidst the hurly-burly of Bangkok’s rush hour. I positioned myself at the side of a minor road with my camera at hand. And tried to shift my focus: from the masses of people to single moments, single vehicles, single people. And with every face that I captured with my lenses, I started to calm down. I stepped out of the overwhelming mass and began to see the small, wonderful details again. Sometimes, it is all just a matter of what we focus on. Finally cycling! Finally sunshine! I had managed to cross into Laos just before a major cyclone hit that area of Southeast Asia. Days and days filled with copious amounts of rain, incessant rain, rain that left no part of my body dry, that chilled me to the bone. There is no point trying to defy a cyclone, least of all by cycling. Thus, I had spent those days of endless rain on a boat which followed the course of the river Mekong towards Luang Prabang. Another day of rain in Luang Prabang. And then… the sun came out! It did not matter that it was already afternoon when the sun emerged from behind the clouds. It did not matter that I would surely get into darkness on the way back. I wanted to cycle and I wanted to cycle NOW. The rain had me trapped for so long that I could not wait a minute longer. I hopped onto my bike Emily – unloaded! – and enjoyed how easy cycling can be without the extra weight of panniers. Had we walked, one could have said that Emily and I took a leisurely stroll, through villages, past fields, over a few hills, towards the waterfalls of Kuang Si. So water again, but this time sublimely lit by the rays of late afternoon sun. 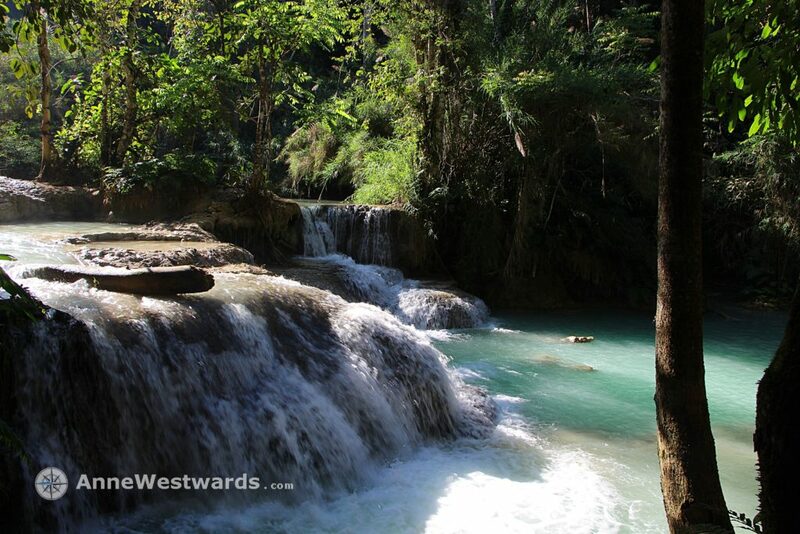 Water flowing in abundance through the equally rich tropical vegetation, lit up by wonderfully warm rays of sun. The palette of turquoise, brown and green – an endless variety of those colors. And all of them brought to a brilliant radiance by the sun. Oh, the sun! I hope you enjoyed riding along for those 13 moments all over Asia and the Middle East! If you would like to have some inspiration for the upcoming year, reminding you of the beauty of the world, I also created a beautiful photo calendar with these photos. If you’d like to support me a little bit on my journey, you would make me very happy by ordering one (…or two… ;-)). 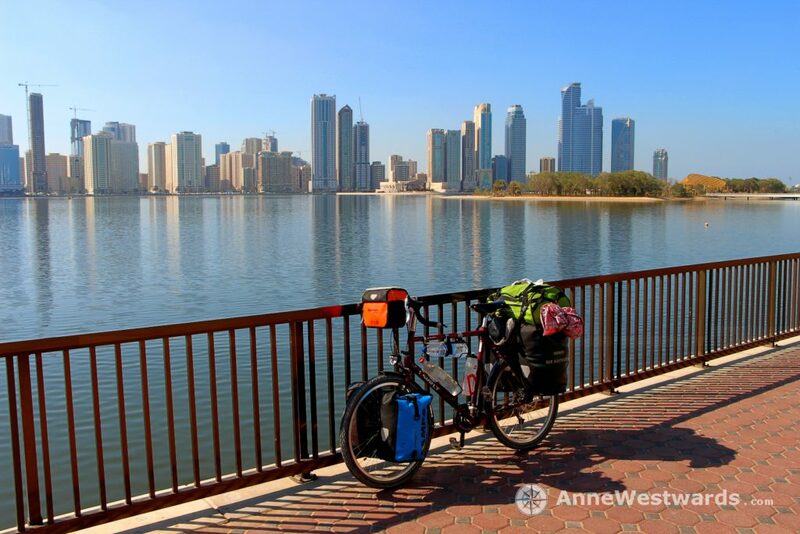 I am starting my self-employment these days, narrating the story of this expedition in words and photos – such that I can continue exploring the world by bike. Any support in this is much appreciated. You can find all relevant infos for purchasing the calendar here. That being said: have a wonderful advent season and a great start into 2019! If you want to know where your mind traveled, check out the map below (and yes, I still need to update the route through South-East Asia 🙂 ).